Preheat your oven to 400 degrees. In a pan over medium heat, sauté bell pepper, onion, ½ tsp. salt and ¼ tsp. pepper in olive oil for 3-5 minutes. Combine seasoning ingredients in a small bowl. Add ground meat, and continue cooking for an additional 7-10 minutes. When the meat is almost done cooking, drain the liquid from the pan and add seasoning ingredients.Continue cooking until meat is completely cooked through. 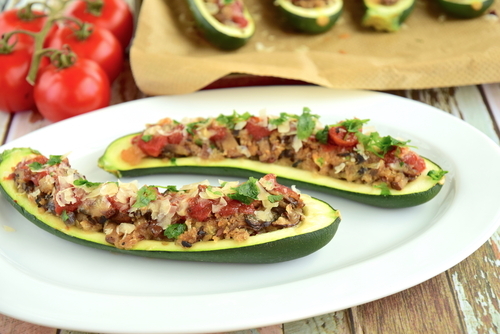 Line a rimmed baking sheet with aluminum foil and place zucchini boats on it (cut-side up).Drizzle a bit of olive oil and sprinkle salt on the inside of each boat, for seasoning.Scoop even amounts of meat mixture into the 4-5 zucchini boats. If you want to make them smaller you can cut them in half. Cover boats with a sheet of aluminum foil and cook for 15 minutes. Remove the aluminum foil and continue cooking for an additional 10-15 minutes, or until zucchinis are completely cooked. Once fully cooked, take them out of the oven and serve with chopped onions on top. If you are in phase 2 you can add cheese as well. I make “unboated” zucchinis. Just chop the zucchini. Much easier. This is a great dinner and so easy to replicate. One question though, what size zucchini’s is this recipe based on as we used medium to small (King Sooper’s organic zuchinni’s) and where left with a lot of ground beef?